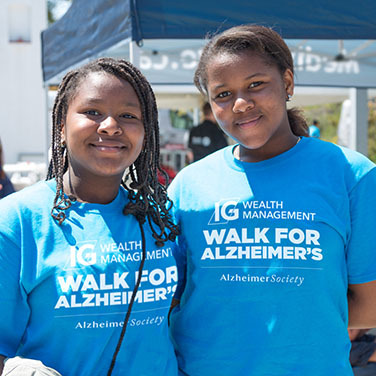 When you participate in the IG Wealth Management Walk for Alzheimer's, you join thousands of Canadians who want to see a world without Alzheimer’s disease and other dementias. What is the IG Wealth Management Walk for Alzheimer's? The IG Wealth Management Walk for Alzheimer's is Canada’s biggest fundraiser for Alzheimer’s disease and other dementias, taking place in over 300 communities across the country. In 2018, Canadians participating in the Walk raised over $5 million. These funds will go toward local programs and services that improve quality of life for people living with dementia and their families-in your community-and support awareness and education about dementia. Make memories matter! When you walk, you’re sending a message of hope to Canadians living with dementia, and thousands more who care for them. When you fundraise, you’re promising them that help will always be available. Join our Walk today! It’s fun, keeps you fit and raises much-needed funds and awareness.